Employees that need access to certain business data on the go can now build their own app for it using a tool from Microsoft that went into public beta on Friday. The company has announced that it's opening up its PowerApps app creation service to the world, after a private beta period that began last year. 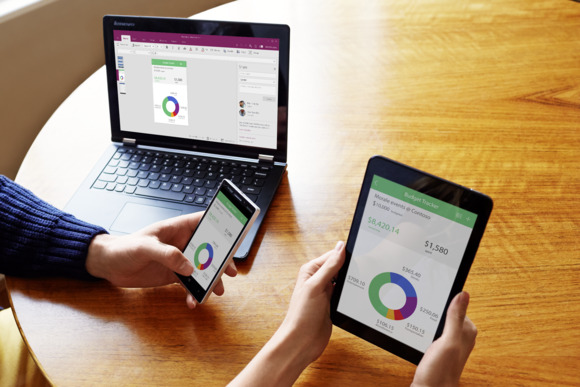 PowerApps allows line of business employees to take data from a variety of sources and create apps that run on phones and tablets without requiring them to do any coding. Developers' time is often constrained, so doing something like creating a mobile expense reporting app might not be a top priority, even if it would save time and money. Applications built with PowerApps, which can run on iOS, Android and the web, can pull data from sources including Dropbox, OneDrive, Dynamics CRM and SharePoint Online. That's notable, since it shows Microsoft reaching outside its own products to include some that it competes with. Apps built with PowerApps can then be loaded into the PowerApps app on iOS and Android, and accessed on the go. The apps aren't full native mobile apps, so companies shouldn't think of it as something that could be used to create a product for consumers or for external use. When users first sign into PowerApps, they're greeted by a set of sample applications that help show them how to do things like track a budget. Once they're comfortable with the service, they can download the PowerApps Studio from the Windows Store onto a computer running Windows 10, and build applications with it. They can then make that application available for colleagues to use on their phones, tablets and the web. Businesses that rely on Microsoft Access to build applications should pay particular attention to this launch, since this seems to be something that replaces the app-creation capabilities of Microsoft's prosumer database product. PowerApps's capabilities feel similar to some of what Access is capable of, and also extend those powers to mobile devices. Microsoft hasn't said that it plans to replace Access, but giving it major updates and improvements doesn't seem to be one of Microsoft's priorities. At the very least, PowerApps should be of interest to Access-reliant organizations because it could do what that application does better, even if Microsoft doesn't choose to replace it wholesale. With PowerApps, Microsoft is playing in a rough and tumble market, which includes Salesforce and SkyGiraffe, a startup that the company funded through its Microsoft Ventures program. The latter has said that it looks forward to competing with Microsoft in this arena.